National Super Alliance (NASA) supporters holding poster of opposition leader Raila Odinga ride on a bike as they demonstrate in Nairobi, Kenya, Wednesday Oct. 11, 2017. The protesters are demanding a change of leadership at the country's election commission. 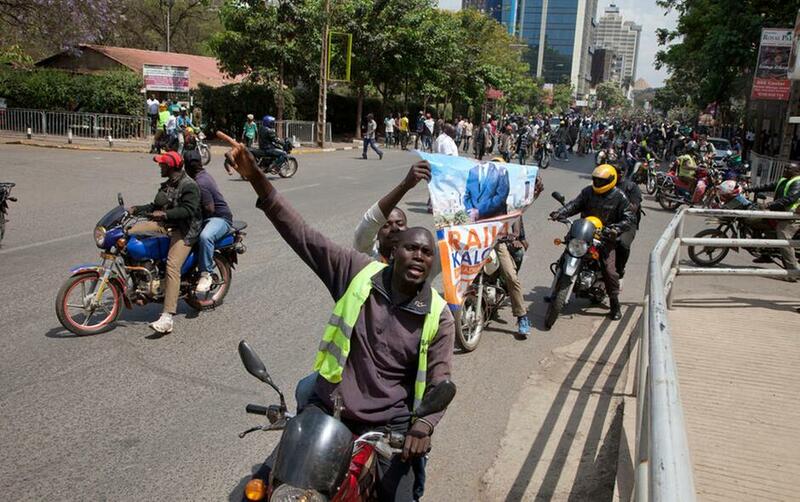 The protests took place in the capital Nairobi and the opposition stronghold of Kisumu, in western Kenya, as well as in the coastal city of Mombasa. NAIROBI, KENYA (AP) — A Kenyan judge on Wednesday ruled that a minor opposition candidate can run for president in this month's election, bringing fresh uncertainty a day after opposition leader Raila Odinga withdrew from the new vote ordered by the Supreme Court. At the same time, lawmakers approved amendments to the electoral law that have been criticized by the opposition and Western diplomats. The amendments require the approval of President Uhuru Kenyatta, whose ruling party sought the changes after the Supreme Court nullified Kenyatta's election in August and cited "irregularities." Elsewhere in Nairobi, police used tear gas to disperse thousands of opposition protesters who regrouped outside the election commission's offices and demanded reforms. Wednesday's court ruling appeared to open the way for other presidential candidates in the August election to run again on Oct. 26, though none aside from Kenyatta and Odinga received even 1 percent of the vote. Justice John Mativo said he did not see any reason for Ekuru Aukot to be barred from participating in the repeat election. Aukot won about 27,000 votes of more than 15 million cast in the invalidated poll. The Supreme Court last month rejected the August election in which Kenyatta was declared the winner after Odinga challenged the results, saying hackers infiltrated the electoral commission's computer system to manipulate the vote in Kenyatta's favor. Odinga then surprised Kenyans on Tuesday by withdrawing from the fresh election, saying the electoral commission must be changed or the new vote risked having the same problems. His withdrawal created confusion in East Africa's largest economy, with observers wondering how the new election might go forward. The election commission has said it was meeting with its legal team on the way forward. Kenyatta, who called the Supreme Court judges "crooks" after their ruling, has said he does not want changes to the election commission. His Jubilee Party has instead has used its parliamentary majority to push for the changes to the electoral law. The opposition says the changes are meant to make the transmission of election results a manual process that would have fewer safeguards against fraud, and would make it more difficult for the court to annul an election. Diplomats including the United States ambassador this month said the proposed amendments put at risk the election commission's "ability to conduct a better election" and unnecessarily increase political tensions.